RadPivotFieldList is an integral part of RadPivotGrid. It gives the users the power to modify RadPivotGrid and generate many different reports with the current data. Automatically change RadPivotGrid generated report when the "Defer Layout Update" is unchecked. 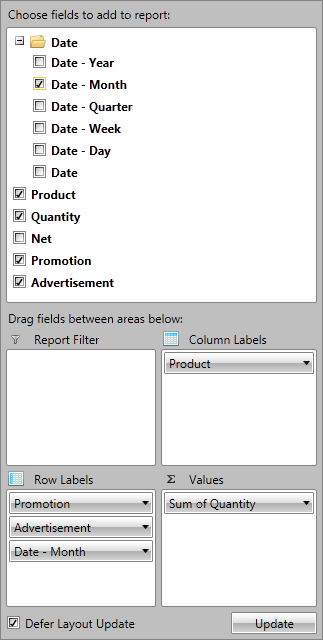 Using CheckBoxes to mark the data you want to include in the RadPivotGrid. Using percent of GrandTotal instead showing the whole number.